I was very touched by this video, Laura. 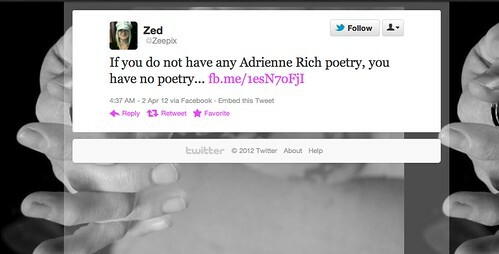 I heard about Adrienne Rich’s death on NPR, and their tribute really introduced me to this complex, creative woman. Yes, culling through the tweets was an interesting experience. Some of them were quite harsh, actually—which speaks of the complexity. Yet there’s a beauty that’s hard to deny. I got shivers at the end of the video when the words about “hands of a daughter” were followed up by that picture of Adrienne with the outstretched hand.